Map of Japanese defenses on Mt. Maculot, 1945. Source: “The Angels: A History of the 11th Airborne Division 1943-1946,” by Major Edward M. Flanagan Jr. The map above has been extracted from the public domain book “The Angels: A History of the 11th Airborne Division 1943-1946,” written by Major Edward M. Flanagan Jr. and published in the United States in 1948. The map shows how the Japanese Imperial Army set up their defenses on and around Mt. Maculot in Cuenca, Batangas in 1945. Note that the Americans spelled the mountain as Macolod; and this was how the mountain was called in many United States Army World War II documents. After liberating the town of Cuenca in March 1945, the United States Army initially left a token force on Mt. 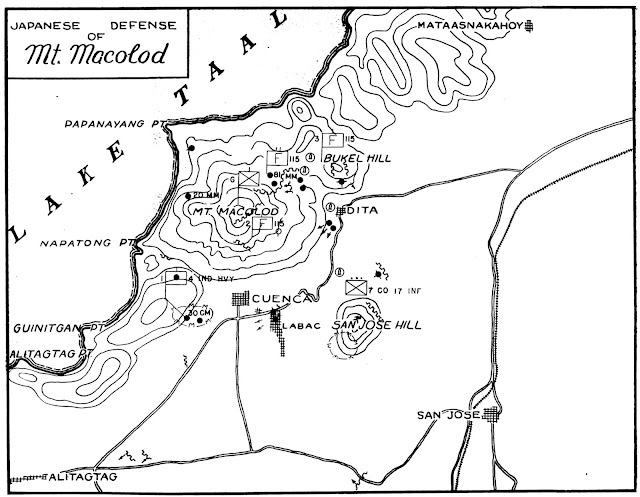 Maculot as the rest of its forces drove on eastward to liberate Lipa, including the vital Japanese airfield which would in the future become Fernando Air Base. The Americans finished the job at Maculot in April in what some World War II documents call among the fiercest battles fought in the Western Pacific Theater of War.